We try to take advantage of nice weather, longer days, and saving money at my work. So for the past several years we have the option of working four ten-hour days from Memorial Day (May 30) to Labor Day (September 1 this year). The work day goes from 7:00 am to 5:00 pm. That’s an hour earlier in the morning and an hour later in the afternoon than my typical work day. We can choose between taking off a Monday or a Friday. I chose Mondays. Instead of getting up an hour earlier than my usual time, I only get up about 20-30 minutes earlier. Ergo I don’t have time for breakfast at home so I eat something at work while I check my email and get ready for the day. Today is the last day of “summer hours”. And it’s the last day of eating the same breakfast I’ve eaten Every. Single. Work. Day. This. Summer. I’m tired of it and I can barely get the food to my mouth. Three Nekot cookies with peanut butter. A 16 ounce cup of peach green tea. And one biotin tablet, one B-complex vitamin, and two vitamin D caplets. The apple is for lunch. Quick. Easy. Non perishable. No refrigeration required. 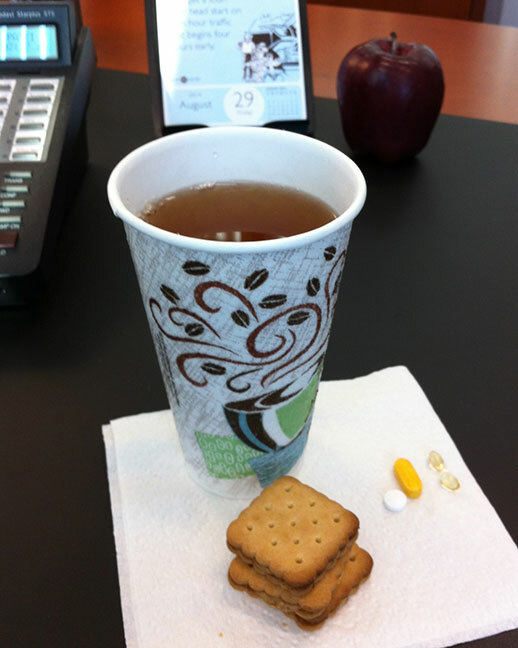 Oh, I’ll still drink the tea (at home) and eat the cookies (until they’re gone) and, well, take the vitamins (as always) but I can have more variety for breakfast starting next Tuesday. Toast with peanut butter and honey or bananas. Scrambled or fried eggs. Warm toasted bagels with cream cheese. Cereal. Leftover cake or pie with ice cream – don’t judge. I know you eat that, too. This entry was posted in food and tagged breakfast, food by Patti_is_knittinginflashes. Bookmark the permalink.